Bridport and West Dorset Open Studios is becoming quite a busy affair if the launch at the Bull Hotel yesterday was anything to go by. It was a really pleasant evening filled with artists and art lovers. All the local artists who take part in the Bridport Open Studios submitted three 6×9″ artwork which was displayed along the long walls of the Ball Room with prices almost as eclectic as the art on show. Having said that there was nothing above £90 so it was all affordable, even from more established artists like Kit Glaisyer or John Boyd. Many artists were there which was great for buyers who could have a chat with them and for artists who could tempt the art lover to come and see larger work in their studio in the coming week. How did Bridport Open Studios start? I had a chat with Caroline Ireland who started Bridport Open Studios in 1999. Back then, she knew there were a fair few artists working locally but there was a lack of outlets for showing their work and coordination was needed to reach out to the public. A few posters around the town, some meetings, a lot of hard work and the annual event was born. It gets bigger every year attracting more and more artists and art lovers. This year, the team who organise the Bridport and West Dorset Open Studios was headed by fellow artist Philomena Harmsworth who directed the 10 day long event. With 58 venues, some with several artists, the usual August Bank Holiday weekend was getting too short if you wanted to see all the local artists studios (or even half!). My favourite part of the evening, apart from chatting with several artists and friends, was to see seven year old Sarah proudly hand her £2 pocket money to buy an original work of art from Sheila Edmunds. Sheila is part of ‘Spectrum’ a collective of talented amateur artists who will show their work in the Friends Meeting House in South Street on Saturday 21st. 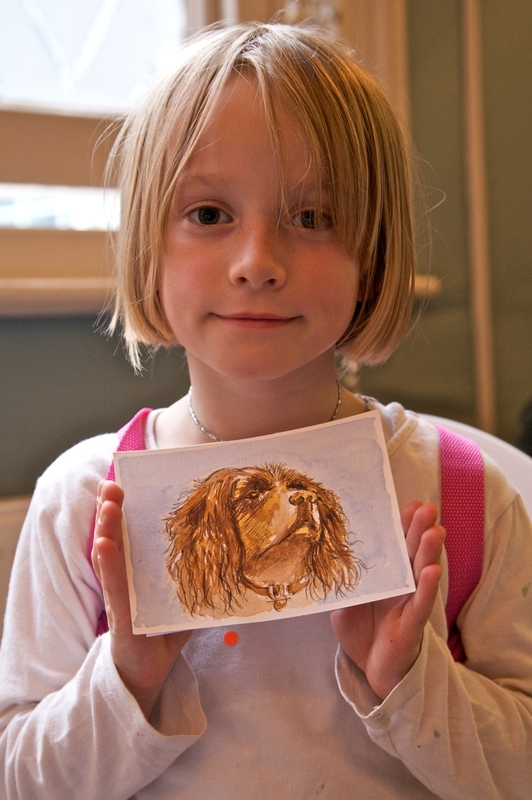 As for little Sarah, she was very happy with her watercolour of a dog that she tells me she will hang in her room. Bridport and West Dorset Open Studios, 21-30 May 2011.